In my nearly-four years of motherhood I have had the unique privilege of “momming” in several cities around the world. And you know what I’ve noticed? Moms, and how they do the whole Mom-Thing, are as distinct as the cities they inhabit. Now I am no expert in sociology, but I do like to secretly judge people based on my biased observations of their behavior. Moms happen to make the perfect target for my not-so-scientific evaluations. Seattle Mom’s family consists of…her husband (an engineer at Boeing), three kids, and the family dog. Silicon Valley Mom’s family consists of…her husband (an entrepreneur/tech mogul), two children (and she wouldn’t even DREAM of having more), and her childrens’ au pair who lives in the backyard guesthouse. Seattle Mom is originally from…somewhere in the greater Puget Sound area. Maybe Sequim or Puyallup. Silicon Valley Mom is originally from…Not-Silicon-Valley, most likely Not-California, and quite likely Not-America. She can’t fathom how you would pronounce “Sequim” or “Puyallup”. Seattle Mom spends her day…going to Baby Bootcamp in the morning followed by a park play date. While her baby naps in the afternoon she prepares dinner, using mostly fresh and local ingredients. Silicon Valley Mom spends her day…managing a tech startup. She uses an app on her iPhone to order food from The French Laundry or Coi so she can pick up dinner on her way home. Seattle Mom lives in…a split-level home in the suburbs with a nice big yard for their organic vegetable garden. Silicon Valley Mom lives in…a $1 Million rambler built in the 1950’s (but she’s working with an architect now on design plans to tear down the rambler and rebuild a $2.6 Million “cottage” on the property). Seattle Mom wears…a Gore Tex jacket over her North Face puffy vest, jeans, and a pair of Chucks or rain boots. Silicon Valley Mom wears…a fully coordinated Lululemon outfit (from this season), wedge sandals (so you can see her perfectly pedicured toesies), and a Coach purse. Seattle Mom drives…a minivan (she just traded in her Subaru Outback). Silicon Valley Mom drives…a Tesla Model S (she just traded in her BMW X6 so she could get the coveted “Clean Air Decal” and use the carpool lane when she’s solo-driving to her Friday morning spin class at Equinox). Seattle Mom commutes…on I-5. There is no other option. Silicon Vally Mom commutes…on “The Five”. Or 101. Or 280. Or 880. Or 85. Or 87. Or 17. Or CalTrain. Or BART. Seattle Mom washes her car…in the rain. Why would you ever wash a car? Silicon Valley Mom washes her car…at any of the thousands of “hand touch” car washes that line every street everywhere. Her car is washed and detailed at least once a week. Seattle Mom spends her weekends…taking family bike rides along the Burke-Gilman, shopping at the Ballard Farmer’s Market, and walking her dog at Greenlake. Silicon Valley Mom spends her weekends…shuttling her children between lacrosse games, karate belt tests, ballet recitals, Chinese school, engineering daycamp, violin lessons and water polo practice. Seattle Mom’s preschool choice for her children…was based upon which school would nurture her child’s individuality. It’s affordable and there’s a good community of parents at the school. Silicon Valley Mom’s preschool choice for her children…was already applied for before she left the maternity wing of Stanford Hospital. The preschool is nationally ranked for it’s strong emphasis on the Arts and college prep. There is daily instruction in foreign language and advanced circuit design. The Annual tuition is equivalent to the cost of a new home in Seattle. Seattle Mom’s grass…is mowed by her, or her husband (if she’s lucky) or the neighbor boy (if she’s really lucky), or by nobody at all (during the months of October-April when the grass doesn’t grow because it’s just too dang cold outside). Silicon Valley Mom’s grass…is mowed by The Gardener who comes every Tuesday morning like clockwork. Seattle Mom’s favorite grocery store…Whole Foods and Metropolitan Market (but she actually does most of her shopping in the bulk section at WinCo). Silicon Valley Mom’s favorite grocery store…Nob Hill Foods and Google Shopping Express. In regard to weather, Seattle Mom dreams of…the sun. That is all. In regard to weather, Silicon Valley Mom dreams of…just a touch of rain to get rid of this drought. As long as the rain doesn’t stick around long enough to force her under an umbrella. Seattle Mom loves…her kids more than anything else in the world. Silicon Valley Mom loves…her kids more than anything else in the world. So, differences aside, maybe that’s all that really matters anyway. No matter where we’re from or where we find ourselves, this Mom Thing all boils down to one thing: loving our kids. Rain or shine, here or there, just loving those kids. And that will never change–even if you do decide to trade out your rain boots for some flip flops. How To Shop Childrens’ Consignment Sales. Like A Boss. 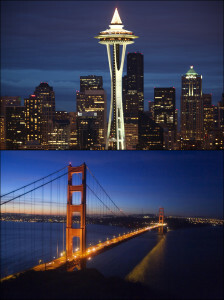 I think I prefer Seattle Mom, and yes I think it is closer to Ireland Mom!